As a lover of all things words and story, it wasn’t hard to convince me to try Haywood Street’s Wednesday morning Story Circle. As seems to be the way around this place, I was greeted with the kind of warmth that envelopes you; the kind that takes the chill off of a frosty February morning. This particular meeting fell on our friend, Joe Rob’s, birthday. He tells me there won’t be much fanfare; that he intentionally starts celebrating his birthday one and one half weeks early, so that by the time the actual day comes there’s no stress. I tell Joe Rob I like his style. I’ve heard Rev. Combs talk a lot about walls and doors lately. Mostly, he wants them knocked down and torn off the hinges. He wants the space that is Haywood Street to be as open and inviting as it can be. But, Joe Rob is in a different head space today. Today, Joe Rob is loving him some walls. 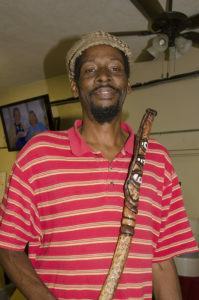 Joe Rob found his way to the Haywood Street Story Circle more than three years ago. In fact, the first gathering he attended was only the second time the group had met. Growing up as a pastor’s son, our friend had become tired of the monotonous, obligatory nature of his worship and had strayed a bit this way and that. By the time he landed at Haywood Street, he was homeless, living beneath bridges, and subject to the elements. Almost immediately though, Barbara Bates Smith and the other Story Circle attendees scooped him up and became his family. “We’re family because we share our story,” he tells me. And what a great definition of family, right? The folks you share your story with. So we’ve got Rev. Combs talking wall demolition and Joe Rob praising wall construction and to me it just looks like two equally sacred ends of a spectrum. There is so much holy in radical inclusion, and at the same time, something good in the creation of sanctuary. And, I suppose sometimes it takes a few external walls to feel safe enough for the internal walls to come gracefully crumbling down. Story Circle is led by companion Barbara Bates Smith on Wednesdays at 9:00 a.m. in room 4-B. All are welcome to join.